Betty Samora was born Lisiada Piedad Archuleta November 5, 1920 in Monte Vista, Colorado. She lost her name in first grade when the Anglo teacher could not pronounce it. Thus, the first grader became Betty. 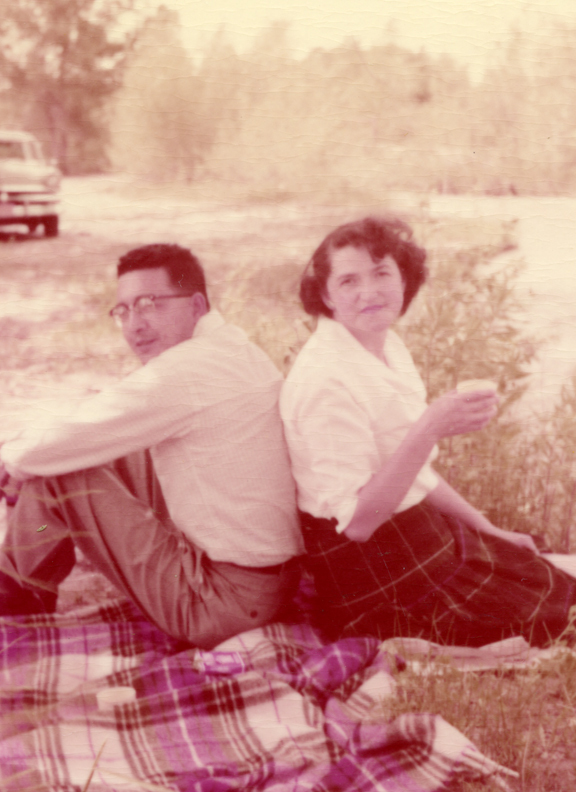 Betty attended Adams State Teacher’s College in Alamosa, Colorado where she met Julian Samora. They married in Novemebr of 1942 and Betty graduated with a degree in Education. Betty was a full partner in her marriage and worked tirelessly to mentor students and help them succeed in college or graduate and professional school. Betty helped establish a bilingual pre-school for the children of migrant workers in the southern Michigan northern Indiana area, and she and Julian raised five children. Betty Samora died in South Bend, Indiana on June 20, 1979 of ovarian cancer. … Betty brought more than her liveliness to their union. She believed in him and fully supported his vision of social activism. Although she was pregnant with their first child, Betty served as the co-investigator for the research that led to Julian’s master’s thesis. The thesis was titled “The Acculturation of the Spanish Speaking People of Fort Collins, Colorado in Selected Cultural Areas”. They both joined the Spanish Activities Committee at Holy Family Church and Julian served as secretary to Fr. John Fullana, the parish priest. The Rev. David Cisneros, of the Spanish Presbyterian Church, had been a school friend of Julian’s in Pagosa Springs. He introduced both Betty and Julian to his parishioners and appointed them co-directors of the recreation program for Spanish-speaking youth. They lived for a year in the Spanish- speaking section of Fort Collins. In that way, they came to know both the Catholic and Protestant Spanish-speaking community they wished to study. Still in their twenties, Julian and Betty already deeply felt the burden of leadership. The Mexicanos needed leaders. But being a leader in the Mexican community meant learning about and understanding the Anglo culture in order to bridge the two cultures. The challenge for the Mexicano leader was to learn about the Anglo world without giving up his Mexican culture. In other words, becoming bi-cultural. There was an unending torrent of bigotry leveled at Mexicans and Mexican Americans during this time. Some was subtle and some was quite overt. I visited with Mr. Al Salazar whose wife, Connie, had been one of Betty’s closest friends in college. He gave me some insight into the life my parents led as a young couple and the more or less constant assault to their dignity they all endured. What made my parents different is that they fought back by changing institutions. After the war, when the two couples were living in Alamosa, Al and Julian joined the Knights of Columbus, the service organization connected with the Catholic Church. Betty and Connie wanted to join the Rosary Society. It was a club for educated women, Anglo women. The club read and discussed books, did good works and so forth. The priest suggested the two women join the Altar Society, whose membership was composed of Mexican American women who washed and ironed the priest’s vestments and altar cloths. I can just imagine those two college educated women, with their own laundry considerations, telling the priest they would much prefer to discuss books. Mr. Salazar told me that at my father’s urgings, the priest combined the two societies, opened them up to all women, and Betty and Connie became members of the Altar and Rosary Society. Yet, it was Betty’s continued support that made possible what Julian considered his greatest legacy. By 1971, Julian’s vision to educate the next generation of scholars, educators, policy makers, and lawyers was coming to fruition, made possible by grants from the Ford Foundation and later the Graduate and Professional Opportunity Program from the U.S. Department of Education. In all, fifty-seven students were accepted into the Mexican American Graduate Studies Program and almost all received advanced degrees in sociology, government, law, history, psychology, or economics. Julian considered this program his greatest contribution and he put his soul and heart into it. All his creative skills went into this plan to train leaders. And it was Betty’s vocation of hospitality, her readiness to share a hot bowl of beans and a warm homemade tortilla with students homesick for their cultural roots that nourished the program. Julian’s Mexican American Graduate Studies Program was in full operation and Betty embraced her role of wise friend as she listened and helped the students and their spouses come to terms with the demands of graduate school and the Midwest. To stimulate the students, provide mentoring and role models for them, Julian invited many, many prominent people to speak at Notre Dame. Cesar Chavez; author Paul Horgan; three Chicano Archbishops; two Hispanic governors of New Mexico, Jerry Apodaca and Toney Anaya; author, Rudy Anaya; Vilma Martinez, Chief council and President of the Mexican American Legal Defense and Education Fund; filmmakers Moctezuma Esparza and Jesus Treviño. They all came to South Bend, and most dined in our home. …When the three Chicano Archbishops came to Notre Dame, Mom asked me to help cook the meal. I was thrilled to be included; I was in college and not at home very much. Mom told me the guests would arrive at 6 PM and dinner would follow drinks…In my naïveté, I had no idea how long drinks could take. The meal was simple: beans, tortillas and red chile, so it held while the guests regaled one another with stories. I remember that Archbishop Flores from San Antonio was especially complimentary about my meal and my efforts as Betty- in – training. Betty also had her own career. She taught migrant preschool children. She formed a Catholic women’s support group in 1966 that still meets once a week. She took on an orphanage in Merida in the Yucatan, organizing regular donations of goods and money. With us in tow, she picketed the A&P for selling non-union California lettuce; and subsequently we picketed grocery stores for selling non-union grapes. She made bread every week. She made tortillas almost every day. She canned the produce from the garden. She read voraciously and she was a vivacious dinner companion. –Samora, Carmen (2009). Grace and Redemption: Julian Samora, 1920-1996. In A. Lopez Pulido, B. Driscoll de Alvarado, & C. Samora, Moving Beyond Borders Julian Samora and the Establishment of Latino Studies (pp. 9-30). Chicago: University of Illinois Press. Betty Samora spent her early years in Colorado, where she attended college and received a degree in education. After marrying Julian Samora, she traveled with him to the University of Notre Dame when he accepted a position as professor there. Betty’s world thus took a dramatic turn. She witnessed the poor living and working condition of Hispanics in the surrounding communities. She began a lifetime campaign to lobby and convince the local school corporation of the necessity of developing a bilingual program, which eventually became a bilingual department that now covers grades K-12. This work has changed the Hispanic community of the area. Betty was working with parents and children to value and commit themselves to an education that would reduce the 65 percent dropout rate among the high school students. The Hispanic community became aware of the important impact this work would have on future generations. Betty is now deceased, but her immediate family was the initial financial contributor to the Hispanic Women’s Scholarship Fund, which lives to this day to help young minority scholars achieve their educational dreams. –Villa Parra, Olga (1999). Hispanic women: Nurturing tomorrow’s philanthropy. (L. Wagner, & A. Figueroa Deck, Eds.) Hispanic Philanthrthropy Exploring the Factors that Influence Giving and Asking , 24, 82.